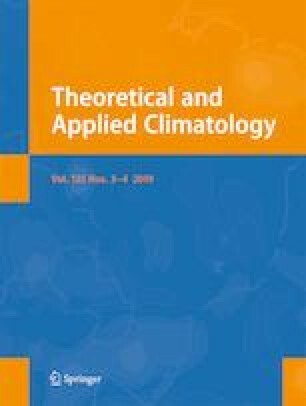 In this study, extreme rainfall indices of Olimpiyat Station were determined from reference period (1971–2000) and future period (2070–2099) daily rainfall data projected using the HadGEM2-ES and GFDL-ESM2M global circulation models (GCMs) and downscaled by the RegCM4.3.4 regional model under the Representative Concentration Pathway RCP4.5 and RCP8.5 scenarios. The Mann-Kendall (MK) trend statistics was used to detect trends in the indices of each group, and the nonparametric Wilcoxon signed ranks test was employed to identify the presence of differences among the values of the rainfall indices of the three groups. Moreover, the peaks-over-threshold (POT) method was used to undertake frequency analysis and estimate the maximum 24-h rainfall values of various return periods. The results of the M-K-based trend analyses showed that there are insignificant increasing trends in most of the extreme rainfall indices. However, based on the Wilcoxon signed ranks test, the values of the extreme rainfall indices determined for the future period, particularly under RCP8.5, were found to be significantly different from the corresponding values determined for the reference period. The maximum 24-h rainfall amounts of the 50-year return period of the future period under RCP4.5 of the HadGEM2-ES and GFDL-ESM2M GCMs were found to be larger (by 5.85%) than the corresponding value of the reference period by 5.85 and 21.43%, respectively. The results also showed that the maximum 24-h rainfall amount under RCP8.5 of both the HadGEM2-ES and GFDL-ESM2M GCMs was found to be greater (34.33 and 12.18%, respectively, for the 50-year return period) than the reference period values. This may increase the risk of flooding in Ayamama Watershed, and thus, studying the effects of the predicted amount of rainfall under the RCP8.5 scenario on the flooding risk of Ayamama Watershed and devising management strategies are recommended to enhance the design and implementation of adaptation measures. The authors would like to express their gratitude to the Turkish Government Directorate of Meteorology for providing both the current and future period daily rainfall data of Olimpiyat Station. The authors are particularly indebted to Mr. Utku M. Sumer and Mr. Hudaverdi Gurkan for their direct involvement in the provision of the abovementioned data.